Labor day… I hope you all had a fabulous weekend! I worked. All weekend. Stuff for my day job. And this week my life has pretty much been work-sleep-work-sleep-say hi to #1 son-sleep-work. Not fun. But I have to keep reminding myself that it does pay the bills. But I haven’t been knitting. There. I said it with my out loud voice. The problem is, I’m typing virtually all day right now. By the time I get home, my hands just won’t take any more use. So I sit in front of the TV like a zombie for an hour, and then I go to bed. I did get a tiny bit of knitting accomplished before the boom lowered. I had so much fun on the Swallowtail Shawl that I decided to go back to the Pacific Northwest Shawl for a bit. You’ll remember that I was having a lace jones just before I went to Victoria, and I planned to take this project with me but I couldn’t find the blasted pattern, which I had successfully put in a “safe” place hidden even from myself. 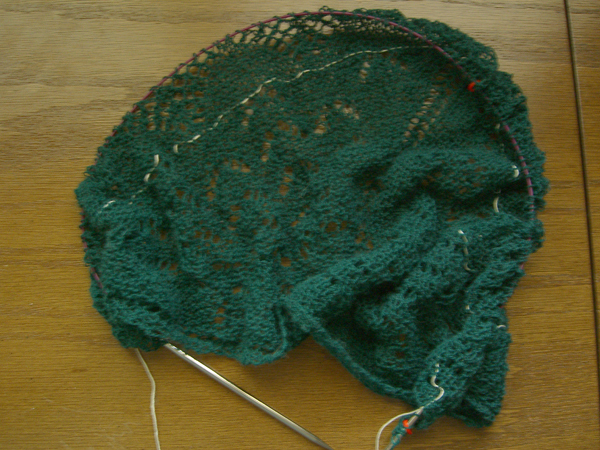 With the pattern now in hand, I managed to work about 4 rows of the pine tree lace. You may notice it’s on one of the Knit Picks needles. I finally caved and bought the set. I really like the cables and the points, and I like the joins on the classic needles. I checked the joins on all of the needles and cables in the set, and everything appears to be hunky-dory. I seem to have escaped the problems with quality that some people have found. The needles don’t seem to me to be as fast to knit with as Addis – probably because they are nickle-plated rather than chrome-plated. But that’s OK with me. I don’t always want a really fast needle. And the points are so much better! I will finish the Victoria Socks. I’m half-way up the ankles, I need to get them done. I will make a pair of long-promised socks for #1 Son before the weather gets too cold. I will make the two pairs of socks I need for Christmas presents, and they will be done on time for giving. I will finish Clapotis #2 by the end of the year. I will finish the Pacific Northwest Shawl by the end of the year. Those last two projects were UFOs at the end of last year, and I don’t want them to suffer the same fate at the end of this year. Are there projects in your bag that have languished for ages? Let’s make an “off the sticks in 2006” pact together and cheer each other on! First, thank you to everyone for the nice compliments on the Swallowtail Shawl! I really appreciate all comments here! How in the world did you find time to knit this in a week? Did you really only use one skein of Sea Silk? Iâ€™ve purchased two and am still thinking of what to do with it. I also read on another blog, that the swallowtail pattern is not the best to knit. Was is easy for you. Would you recommend it to a lace knitting newbie, like myself? I really used just one skein of Sea Silk, and I had some left over. But this pattern, while called a “shawl” is really more of a large kerchief in size. I had enough yarn left over that if I knit this pattern again, and chances are good I will, I would probably go up a needle size. But I knit fairly tightly. I read on a blog (don’t remember which one, sorry) that the knitter went down a needle size on the edging because she was running out of yarn. Like everything, your mileage may vary. Was it easy? I thought it was a fairly straightforward lace pattern. Most of the shawl is the same pattern repeated over and over, so it’s easy to memorize, and the edging is the same pattern repeated twice. The only tricky part is a P5tog. I was knitting with blunt Lantern Moon needles — lovely needles, but way too blunt for lace. I just could not get the needle through 5 stitches. So I slipped two, purled 3, and passed the two slipped stitches over. The result is visually the same. But I was glad to be through that part of the chart. The pattern stitches include a YO, a K2tog, a SSK, and this thingy I forget the abbreviation they used where you slip 2, K1, pass the two slipped stitches over. If you can do all of those stitches and like a challenge, I would say go for it! (I’m an adventurous knitter.) If it turns out that you’re not having fun with it, then you can always rip it out and start something else. No harm, no foul. Another pattern you might consider, since you have two skeins — Wendy has made available her Fir Cone Wrap pattern that is made with two skeins of Seasilk. I haven’t knit this pattern, but the lace looks very straight forward and the results are really nice.